Yep. Want to say ‘sorry’. Please – do accept that…lemon as a gift… and things like that… Don’t know why actually, don’t know what for. Yet – feel it’s a right thing to do. Well, it’s an ongoing struggle, yet – I’ve got over that particular difficulty a little… What I’ve realized recently is, that this web-space of mine has become a bit like a public venue, more than just a personal site. In a sense, I let it open to my ‘invisible’ guests to come and visit, both longing and being frighten because of that possibility – to have dozens of eyes focused on my writing. I like to sense this very online ‘creation’ of mine, this blog, having its own life – new visitors coming despite of me abandoning it. I like to feel just like one of you, my readers, co-creating something what asks, what needs to be created or re-created in order to have our life enriched, our spirits ennobled, our hearts warmed and our minds challenged. What I promise now is that I can’t promise anything. Thanks for you out there for dropping in here and spending your priceless time reading this. Oh, Passion – where are thou? or the way angels struggle to come to being? This poem I wrote today (27/04) with a dedication to all these fighting to become less politely (read: cowardly, spiritlessly) ‘human’ and more authentically alive by finding and cultivating true passions. Recently, I’ve found myself being obsessed with blue. I’m collecting blue hues, I’m mixing countless bluish secondaries. I’m reading lots about the colour history, characteristics etc. I’m trying different media – photography, prints, dimensional work, animation to apply different language and to explore its potential. And first of all, I’ve got a strong emotional and more generally – spiritual response. Blue means power and infinity, in China it symbolises immortality. Blue means freedom and a mystery. This video is just another personal comment on blue. I used the Final Cut Pro and iMovie. One layer is that of a dreaming person (myself) and another one is that of moving butterflies (butterfly – “Papillon” as a symbol of fragile, short-living freedom, freedom of dreaming), which is basically a collage-animation edited by the means of iMovie. A view from an airplane. Taken about 2.00 am. The moon is visible. 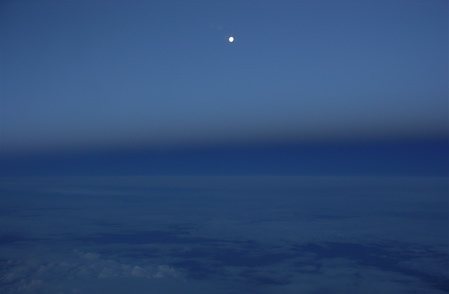 I didn’t enhance the colour – it was really that blue up there. That photo makes me think about freedom and mystery of the world around us. 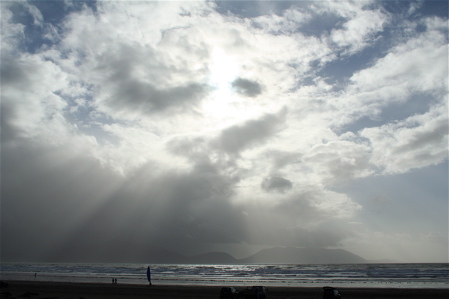 It was just after stormy rain – a phenomenon quite ordinary in that part of Ireland. Nobody was hoping for any Sun on that afternoon, but there it was – powerful and dazzling. I took this photo breaking the sanctified rule of photography of “not to shoot against the Sun”; I’ve been always doing this with usually satisfying outcomes (but never face the Sun for a prolonged period unless you have a proper filters on your lenses, otherwise you’re going to damage them – more advanced readers, please ignore that note). People had just started to emerge from their temporary shelters, totally wet, half-wet or those lucky – quite dry. There was a smell of damp boots in the air and the sound of the ocean was just terrifying. It appeared that the thunderous roar had been originated very deep underwater by a powerful force and was allowed to materialize through the massive rolling waves. 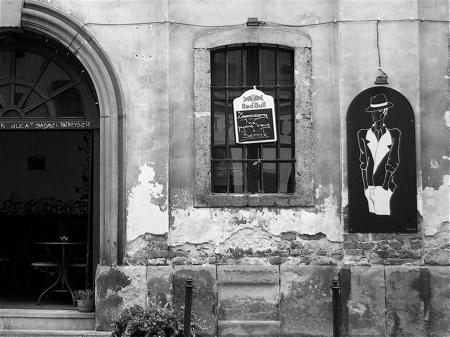 This place exists at the corner of so-called Jewish Market in the former Jewish district of Krakow – Kazimierz (the memorable part of the Shindler’s List of the ghetto being established and liquidated was executed in that district). 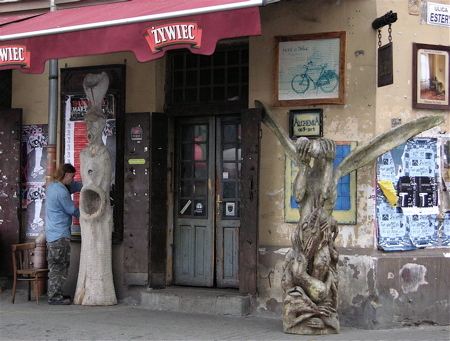 On the black gate there is a small inscription (in Polish) – Street Bar “Just sit down and watch”. It’s very characteristic for Krakow-made sense of humour and corresponds well with the figure of an “elegant” bohemian man. And there is another key to the scene hanging on the window: We invite you for a delicious coffee and cheesecake (both treats are like a Polish sense of home and hospitality in a capsule; they’ve got their coffee and cheesecake on each occasion under the Sun – for family and formal meetings, for the wedding and funeral, in a very poor and very wealthy menu). I enjoy reading the image and extracting senses, I like the way how it tells a story (unfortunately, only to initiated people).